Thanks to the grill, this tasty lamb and caramelised tomato dish is guilt free. 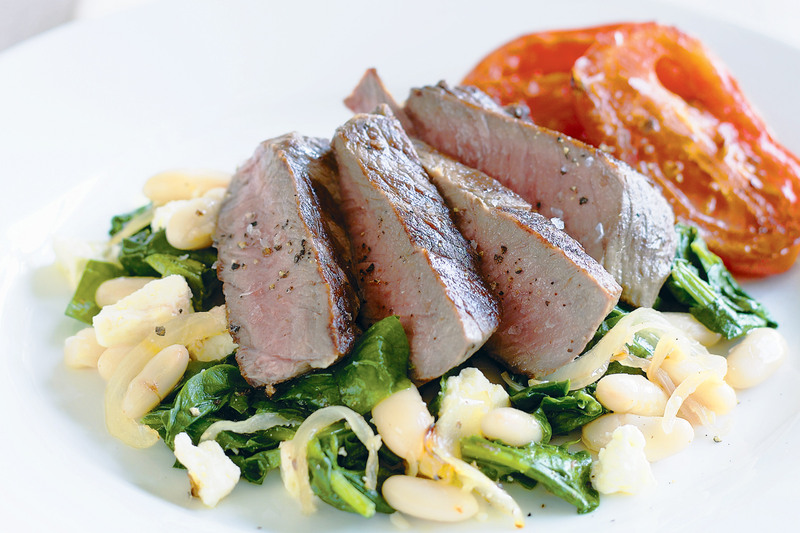 Lean lamb is teamed with feta and lemony cannellini beans for a protein-packed meal. Heat the oil in a large non-stick frying pan over medium heat. Add the onion and cook, stirring, for 4 minutes or until the onion softens. Add the garlic and spinach, and cook for 1 minute or until the spinach wilts. Add the lemon juice and remove from heat. Add the beans and feta, and toss until well combined. Season with salt and pepper. Heat a barbecue grill or chargrill on medium-high. Spray both sides of the lamb and tomato with olive oil spray. Season with salt and pepper. Cook the lamb on the grill for 3 minutes each side for medium or until cooked to your liking. Transfer to a plate and cover with foil. Set aside to rest. Meanwhile, cook the tomato on the grill for 3 minutes each side or until just tender. Thickly slice the lamb across the grain. Divide the bean mixture and tomato among serving plates. Top with the lamb. Season with salt and pepper to serve. Barbecued fish with warm lentils & spinach: Replace the cannellini beans with 1 x 400g can brown lentils, rinsed, drained. Replace the lamb with 4 (about 150g each) skin-on snapper fillets. In step 2, cook on grill for 2-3 minutes each side or until the fish flakes easily when tested with a fork. At the end of step 3, add the tomato to the lentil mixture and toss to combine. Barbecued chicken with warm chickpea salad: Omit spinach. Replace beans with 1 x 420g can chickpeas, rinsed, drained. Replace the lamb with 4 chicken thigh fillets. Add the garlic with the onion in step 1 and cook, stirring, for 4 minutes or until onion softens. Add the chickpeas and cook, stirring, for 1-2 minutes or until heated through. Remove from heat. Stir in the lemon juice, feta and 1/2 cup fresh basil leaves, torn. In step 2, cook the chicken on grill for 2 minutes each side or until golden. Reduce heat to medium and cook for a further 5-7 minutes each side or until cooked through. At the end of step 3, add the tomato to the chickpea mixture and toss gently to combine.